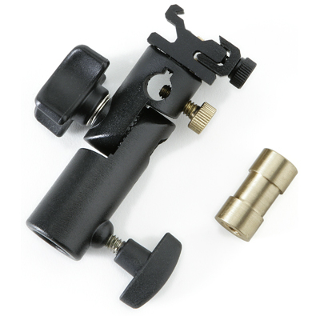 This bracket is designed to hold any shoe-mount flash unit and allow you to use it with an umbrella. It will fit on nearly any light stand with its 5/8” female mount and a reversible, 3/8” and 1/4”-20 threaded, female mount insert. The bracket's swivel joint allows you to tilt the head and umbrella up to 180°.